Okay, maybe “hate” is a strong word. But I highly dislike him. This series of popular children’s books will not make it into my library. 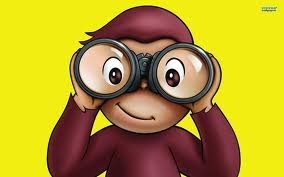 George is described as a “good little monkey” but in reality, we would never reward his “curiosity” and behavior in our own children. He runs away from his caretaker, takes things that he shouldn’t (what we would call stealing) and in early books he smokes. He is obviously representative of a child, and the kids who read the books can relate to him. After all, everyone has an impulse to do things that they are told not to do. When he is supposed to wait in line for a toy store opening in “Curious George Visits a Toy Store”, he snuck inside to make a mess. 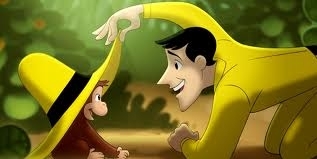 In “Curious George and the Firefighters”, George sneaks away from the tour group to check out the fire station by himself. Each book starts off with him doing something that he should not have. Instead of taking the “Little Red Riding Hood” approach, teaching that rule breaking is detrimental, Margret and H.A. Ray show that disobeying safety rules will lead to a reward. Time after time, George is praised for doing the opposite of what he is told to do. Consequently, the man in the yellow hat is always wrong, and George made the right decision – after all, the end justifies the means, right? Don’t get me wrong, thinking outside the box is a good thing and curiosity is a valuable trait. But George is not the kind of curious I want my daughter to be. When she explores something, it should be in the safety of our backyard, not sneaking off to someone else’s property. In books, neighbors are always nice, but there are some people I do not want her taking candy from. The world is not a safe place for kids who wander off in grocery stores, malls, or zoos. We need to teach children the boundaries of living in our crazy world, and implement basic rules. 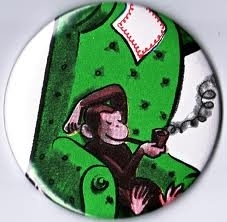 When speaking about George in the past, parents tell me “Oh, kids don’t understand that! They don’t see what you see!” Well, kids are sharp, and when there is a clear pattern of Rule breaking=Reward you bet they see a connection. Children are smarter then we think. They are trained to see lessons in stories. This is not a lesson worth teaching. On August 24, 2011, just one day after the famous Virginia earthquake, Hurricane Irene took over the Bahamas. As I watched the short weather man and his hands spread across the map of the east coast, his grim looking face matched the swirl of dark clouds on the map that hovered over the island in its whirlpool motion. The hurricane is said to be heading towards New York and that certain areas will be instructed to evacuate. The “paranoid” people (meaning, me) ran to the nearest food shops and bought out the aisles of bottled water and canned goods. The shelves were left as bare as an in-compliant school boy’s notebook. I watched the windows of neighboring buildings seal their windows as though they were trying to keep out the devil himself. People blew up their inflatable boats in case they had to row down the flooded streets. Luckily, the storm wasn’t half as bad as expected. Between the earthquake and Hurricane Irene, New York got to experience Nature’s fury twice within one week. Just days after, it was as if nothing threatened the tight and fast schedule of the New Yorker’s bustling life. The sun yellow cabs drove on and the latest rap song found its rhythm in the pungent polluted air. The New York people, from all walks of life, blended once again into the picture of a city that will forever be home to the millions of people – that have come to paint their story onto the grand canvas of a bright and successful tomorrow. When I wrote about Hurricane Irene a week after its occurrence, and I recall how it was broadcasted to affect New York and the other states down the east coast, never did I think that its narrative would be so different to that of Hurricane Sandy. After all, Irene started out as a category 3 while Sandy was only a category 1 a few days before she hit. We have been told before that evacuation would be necessary, we were told to hunker down and stay indoors, we were told to take it seriously. But we heard it before and it was not that bad. We bought out the shelves once before, and so we personally did it again. But I know others who did not, and I could understand why. Why would we do this again, when these weather forecasts seem to overhype the storms and how bad it is going to be? My friends in Florida, who frequently experience storms, seemed to agree. It is exaggerated. It is not really that bad. Only this time, it really was that bad. People had good reason to buy out the store shelves. People were not over dramatizing the dangers when pinning up their doors and windows with large boards of wood. Stores had cause to build a wall of heavy sandbags along the sides of their businesses. Families were not silly to inflate their boats, and were foolish if they did not take heed to the call of the authorities, whom announced mandatory evacuation in areas prone to flooding. Hurricane Sandy wreaked havoc in her wake, as fires, floods, fallen trees and electric lines affected the lives of millions. Seeing pictures of destruction and yellow cabbies floating about, all I can think of is how they were right…It was the worst we have ever seen. 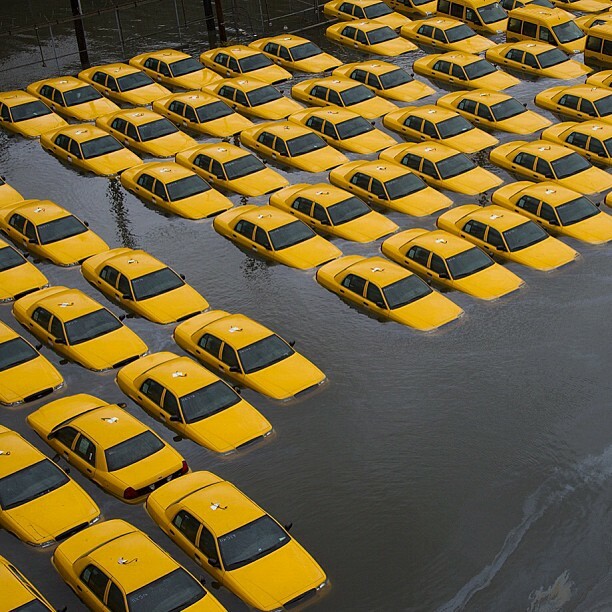 A flooded parking lot filled with taxi cabs in Hoboken, N.J. I grew up in the amazing state of New York. When I settled down in New Jersey to live with my husband and child, I did not look back. I love suburbia. Well, maybe I looked back when storms were a threat, as New York hardly ever loses power in a storm because of the underground wiring. In New Jersey, power is easily lost when a tree rips down the electric wires that run above ground. When we heard that Hurricane Sandy would be serious enough to run down power lines, my husband and I decided that it would be best for us to stay by my parents in New York, where we can have proper heat and food for our child. If we lose power in mild storms, then we probably will lose power in this one. We were right. Our neighbor informed us that indeed, we do not have power. So here we are in New York with power and I cannot help but wonder. In life, how often do we brush off something attention worthy, only because it did not end up being as serious as expected the first time around? I know I do that sometimes. I do not always take heed and listen, as I would sometimes rather not be inconvenienced than staying on the safe side. Little do I realize that it may not hurt to keep caution. I have nothing to lose and everything to gain. It is telling my child that I will listen to what he has to say. You have a tummy ache? Let’s get it checked out. It is telling my parents that I will listen to them when I take my family on a road trip and we will sleep in a hotel overnight, instead of driving with droopy eyes. It is telling my husband that I would rather spend a nice evening at home, than hire a babysitter that we do not know well enough. It is telling myself that I have a life, a family, and many responsibilities. Mistakes happen, accidents occur, and at often times, we cannot control them. But when we can, see your life, listen to your loved ones, and feel contentedness in your grasp. Know that safety always comes first. Care enough to go the extra mile by getting out of harm’s way, and not taking a single moment in life for granted. Sandy taught me this…what did she teach you? 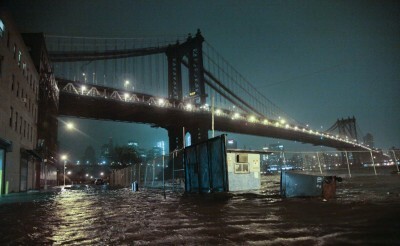 Streets are flooded under the Manhattan Bridge in the Dumbo section of Brooklyn, New York. 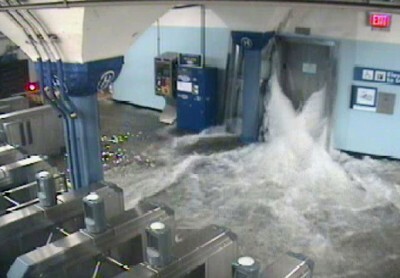 A surveillance camera captures water surging into the PATH station in Hoboken, New Jersey, as it flooded. 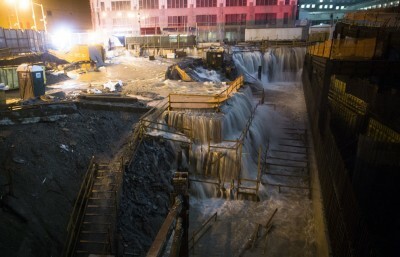 Seawater pours into the Ground Zero construction site in New York, on October 29, 2012.